Rated 5 out of 5 by BooksandGameFan from My pick for best game of the year! Loved it! I haven't loved a game this much in a very long time! It's my pick for game of the year! The storyline was great, the music was beautiful and or creepy which fit within each scene. The mini-games were fun and on some of the games you could pick easy or hard, the hidden object scenes were plentiful and a lot of fun. I loved the graphics and all the different scenes which were just so well done! Yes, like many games you find something to put somewhere else to open it which normally I find boring but not in this game. It just flowed so well, and it wasn't over done. You didn't have to find a million keys or amulets to keep the game moving! That atmosphere was just so entertaining, you went from normal, into dreamscapes which were creepy back to a normal everyday environment, then back into someone else's dream etc. I think that's why it was so much fun because things, people kept changing. I can't really explain why I loved it so much but I know I literally made myself stop playing a few times because I just didn't want the game to end too quickly and that rarely happens for me. There are 2 bonus games, I'm not sure how long each is because I just started playing the first of the two. The main game was approx. 4.5 hours. I rarely buy the CE of a game but I'm so glad I did with this game!! Yes, I highly recommend this game! 2 other games released recently that were also exceptional and I highly recommend are: Paranormal Files: Fellow Traveler and Bridge to Another World Through the Looking Glass. You might want to give them a try as well. Rated 5 out of 5 by fiewi1 from The all-seeing Raven What a game... beautiful arwork, gameflow that doesn't let you breathe, dark in a way that takes you with it, good voice-over, and a bonus round plus a hidden round (of a sort). Only downside; it could be more challenging, but then again is more of a suspense narration than a tough game. So, this for sure is my new fav. Nothing but magic happen in this one! Rated 5 out of 5 by rjohn82677 from Whispered Secrets: Enfant Terrible WHAT A JOY! This game was perfect. I thoroughly enjoyed every puzzle and every HOG! The graphics and colors were outstanding. Moving from scene to scene, but only after each scene was completed, gives the player a sense of satisfaction and success! The storyline is interesting and answers the: "WHY" which every game must have. Lastly, having THREE BONUS GAMES makes this game a KEEPER. I will "change " my profile" and play this game many more times. I recommend this game highly. Rated 5 out of 5 by Majestyx12 from Whisper Hidden Objects and Morphs to me Based on the Completed Games with bonus material. Wow, what a great game. The graphics are so crystal clear and the colors are nice and bright. The hops and most mini-games are fun. Great Extras. The stories are heart felt. When you use the dream catcher you find like 6 or 7 Morphing Objects in the scene. There are also more Morphs that you collect, for collectibles. When you use the mirror that you put a crystal in it-you use it like a magnifier and find a red x. This is a Hidden Hop. I Loved them. Morphs and Hops from these so called gadgets. No Big Deal. Just Fun. When you go to play, you have -1. The Nightmare ( which is the main game) 2. The Last Sleep ( which is the Bonus Chapter) 3. Forest of Dreams. ( The Hidden Chapter) When I came to the end of the bonus chapter it took me to the Memorable Objects Room that you collected in the main and bonus chapter, 35 of them. I missed two. When I hover over the missed ones the mirror displayed the location for the missed ones and I hover over the mirror and it took me to find my missed ones. Once I found all of the 35 Memorable Objects, The Hidden Chapter had Congrat you unlocked the hidden chapter, which is a detailed hop called Forest of Dreams and alot of fun for me. I checked, you can replay it at the Third item at Play- Forest of Dreams. Besides the 35 Memorable objects (they are different things). You collect 20 puzzle pieces you put together and can download. Also you collect 21 Hidden Objects which are Morphs. They have good indicators. The morphs and puzzle indicator is on the tool bar. The Memorable Objects one is on the side and I wasn't clicking it. I guess I should have. I liked all three stories. Ethan's, Amy's at the circus and Naila's.I liked feeding the white magical crow. The bonus chapter continues and it involves yourself. I started counting hops and then mini-hops and I got lost. I tryed look at the replays which it has but they are mixed up and not in order so I don't know where to end. So my count give or take is 25 full hops with 5 mini-hops in the main game and 3 full hops and 1 mini-hops in the bonus chapter. I know not everyone wants to know but that is what I would want to know and some buyers like myself want to know. We have replays of Hops, Mini-games, Movies and Music. 5 chapters. Regular sized game that isn't downsized. My New Favorite. Rated 5 out of 5 by fpours from One of the best I have played. I have been playing hidden object games since 2008. This game kept me engaged the entire time. I play on a Mac Pro and there were no issues at all. The visuals are superb. The story one is clear. It is worth the price for the CE edition. Other reviewers have adequately covered the details. Give it a go and you will not be disappointed. Rated 5 out of 5 by bonnadonna from A One Game Different, challenging, A must have! Rated 5 out of 5 by belamba from Really good entertaining game! I don't buy many CEs these days as they’ve got, in the main dull and boring. Can’t say that for this one. Whilst the storyline is silly, as they nearly always are, the game play was really enjoyable. Didn’t want to stop playing, but have to go to work. The graphics were excellent as was the music. The odd fright but nothing too scary. The puzzles were different, and instead of skipping them which I usually do, these were so entertaining I played them all. The HOPs were unique and for once I looked forwards to them. There’s a couple of extras to use during the game, but no crying cats or whinging puppies. Loads of morphing objects in all parts of the game, and also puzzle pieces to collect. I haven’t finished the game and have been playing for 3 hours. If more games were of this calibre I’d be very happy. Rated 5 out of 5 by Ambrosia81 from Love it already I am only in the middle of the game and I am already captivated! The graphics are fantastic as well as the storyline. I especially love the morphing items, I don't usually play a game unless that is a factor. Rated 5 out of 5 by chrissydoo23 from Want to buy full version! Played demo and loved it. I'm going to read the reviews to see why it only has a 3-star rating. 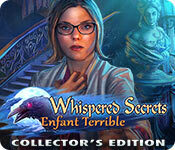 Rated 5 out of 5 by biscuitsmama from WHISPERED SECRETS ENFANT TERRIBLE – A GREAT GAME! Whispered Secrets Enfant Terrible is the ninth game in the series, and it is probably one of the best since the Everburning Candle, a game that I loved. The game’s demo had me entranced – something I can’t say about every game that comes along right not. I found the storyline interesting and just about when I thought it was over, it was only just beginning. Whispered Secrets Enfant Terrible showcases the creativity and technical skill of this development team that in recent years has produced some top-notch games that also include the Reflections of Life and Unseen Fears series. The HOPS are the standard fare but they were excellent. I did feel that there were far too many of the storybook type although they did serve a purpose. Some of the HOPS were very creative and one used the now favored “find so many items in order to begin the scene”, but it was creative and had a different twist. 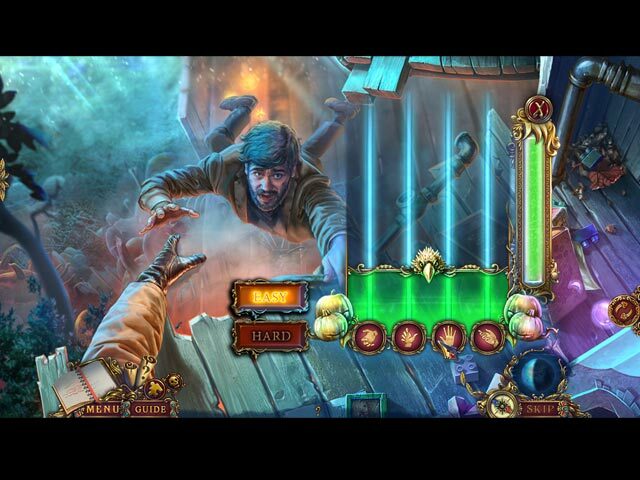 HOPS are my favorite part of HOPA games and I think that these scenes were entertaining and the items were well-created. No trying to find invisible or very tiny items. There are a lot of puzzles in the game but even though most seemed easy there were a few that were more difficult. Some of the puzzles offered either an easy or hard setting but even when I selected the hard option they were still doable. The puzzles were fun and I didn’t find any that I needed to skip even though some of them did have a bit more challenge. If you prefer the CE version of a game, this one includes morphing objects, collectible objects, and collectible puzzle piece to find, as well as achievements to earn as you play. The remainder of the CE package is standard fare but there are two extra chapters included. What I enjoyed most about this game was the storyline and the gameplay. I didn’t always find it easy to know what my next move should be and did need to use the hint button on occasion to nudge me in the right direction. Whispered Secrets Enfant Terrible has one of the best and well-told storylines that I have found in a game in recent years and the further I got into the game the better it became. I can wholeheartedly recommend this game for anyone who enjoys a good mystery and a game that has a few jumpscares thrown in for good measure. Please try the demo to see if you find this game as entertaining as I did. Happy gaming! Rated 5 out of 5 by rainworm from A nightmarish journey – not terrible but terrific! In New York an unknown a disease breaks out, which affects the minds of those affected. They experience vivid nightmares, are drawn into strange and threatening worlds in their dreams. News are reporting daily about new cases. One day, we receive a letter, in which we are invited to investigate a special artifact. Known for our interest in artifacts, that affect human minds, the writer is confident, we will be interested and able to help him. His name is Ethan. Arriving at his place, we experience certain difficulties in entering the house. Ethan himself seems completely out of line and attacks us. It is a combined working of his nightmares together with a dreamcatcher, he got from his psychotherapist, the famous Naila Moore. She gave it to him as a cure, though since he has it, his nightmares are occurring daily and cause a constant rage. The dreamcatcher is the key to Ethan’s nightmares and we use it to enter the strange aggressive world which took over Ethan’s mind. The nightmare world is a fantastic realm, where this world’s laws are not valid.. Ethan is kept prisoner in the chaos of his fears and a traumatic event of his childhood. . What is Naila Moore’s role in this? It was the dreamcatcher, which worsened Ethan’s nightmare attacks. When we meet Naila, she denies knowing Ethan as well as using a dreamcatcher as a cure for a treatment of nightmares, due to childhood trauma. But we find patient cards for the thief and for Ethan. So we have a ‘thriller’ and a fantasy game in one package! The nightmares, we will enter not only Ethan’s but others too, present a fantastic realm, in which we act as the one, who helps the imprisoned person to escape and clarify the cause for the nightmare. On the other hand there is somebody behind the new nightmarish illness and it is up to us, to end this. The game is well designed, both worlds presented with great graphics, suiting music and collectables/morphs are the cream on the cake for those, who love them. HOS and puzzles are both creative, puzzles even with easy/hard option! Plot enfolds fast and the stories within are interesting and enjoyable. Rated 5 out of 5 by sunnyglow from WELCOME TO YOUR OWN WORST NIGHTMARE IN A SWEET DREAM OF A GAME! REVIEW BASED UPON THE ENTIRE GAME. 5 Chapters Plus a Bonus Chapter – Strategy Guide: 43 Pages (This is a long game!) OVERVIEW: Welcome to Nightmare Week at BFG! Tonight, turn off the light, and enter the less-than-pleasant dreams of Ethan Jackson and other characters from this game as you fight Nightmare, a monster which has escaped from the world of dreams. Those targeted develop a tattoo on their arms and experience tormented dreams relating to some traumatic event in their lives. As a detective for the “Dark Light” agency, enter the surrealistic world of dreams of the troubled souls affected and battle and defeat Nightmare’s control over them. Those affected have a connection with a psychotherapist, Naila Moore. How does she relate to this beast and what does she know that she is not sharing? OPINION: This game is a vast improvement for this developer. This is a well-scripted psychological thriller which should appeal to those who love this genre of games. If you love searching for morphing objects, you will love this game. There are quite a few to collect plus there are puzzles and HOP scenes with these morphs as well. Enter a nightmare world of beautifully illustrated scenes which truly reflect a terrifying surreal dreamscape. For the most part I found the pace excellent. However, I did find some parts of the game a little snail-paced. I feel there is one chapter which is superfluous and appears to me as filler to make the game longer. Nevertheless, with a great gaming script accompanied by creatively designed HOP scenes and puzzles, this is a fantastic game! It is an incredibly long game with a rather short bonus chapter. BONUS CHAPTER: The bonus chapter is titled “The Last Sleep.” It is a sequel. After being invited by a professor from the main game to attend a workshop, find yourself back in the dreamworld once again. This time you will be battling Nightmare’s little brother, Eternal Sleep. Locate the Bronze Dreamcatcher to seal away Eternal Sleep forever. The graphics are incredibly beautiful. I like the puzzles and HOP scenes within this chapter. However, it is rather short in comparison to the rest of the game. EXTRA CHAPTER: The extra chapter is titled “Forest of Dreams.” It is not a chapter at all. It is an extra HOP scene which is a variation of a silhouette scene. You must collect all the memorable objects to play it. MECHANICS: There are four levels of play including a customized version. There are fifteen (15) achievements. Collect thirty-five (35) memorable objects. Collect twenty-one (21) morphing objects. Collect twenty (20) jigsaw pieces to play a puzzle after the game is completed. An indicator on the inventory bar tells how many of these collectibles are within the scenes. Most of the collectibles are easy to locate; however, the surreal aspect of the scenes does make it a little more difficult than usual. There are ten (10) wallpapers. There are the usual music selections and video sequences. SMALL COMPLAINT: You can replay twenty-five (25) HOP scenes but only eleven (11) puzzles. With all the excellent puzzles in this game, I am disappointed that this developer only provided a small number of puzzles to replay. Some of these I truly wanted to replay. GIMMICKS: You receive a Detective Magnifier (looks like a mirror) to locate a specific area you need to investigate which is not seen by the naked eye. You need to find a crystal every time you need to use it. You will play a HOP scene in which you search for seven (7) morphing objects. You also receive a dreamcatcher which allows you to enter various dreamworlds throughout the game. HOP SCENES: There are twenty-five (25) HOP scenes within the game from what I could assess. However, there are numerous mini-HOP scenes in which you must locate a small number of items. These mini-scenes are either lists of items or silhouette. The storybook scenes are all the same. You must search for items and then replace them back within the scene. I am not impressed with these scenes. I feel there should be more items to locate and more variety in the design. The rest of the scenes are varied, most are creatively designed with some multiple-step ones. Most require interaction with the scene and some greatly so. They include interactive lists of items, silhouettes in a variety of formats, and matching. You have the option to play a Match-3 puzzle in lieu of the scene. PUZZLES: There are thirty-nine (39) puzzles from what I could assess. Some of the puzzles provide the option to be played in either a “hard” or “easy” mode. The puzzles are varied in difficulty and style. However, I did not find any puzzle challenging. For the most part they are creatively designed. There is a wide variety of puzzles. There are so many puzzles, I just listed my favorites. SPOILERS: MY FAVORITE PUZZLES AFTER THE DEMO: A. Assembly puzzle. Increase, decrease and rotate colored images of a picture until the pieces are sized perfectly to fit a black-and-white image beneath. 2X B. Maze puzzle. Maneuver a man through a maze until he reaches a girl at the end of that maze. Pick up supplies to help fight obstacles in his path. C. Switch puzzle. Switch trophies placing them into their proper positions based on clues at the sides of the row and top of the grid. Each trophy should match up by color and type. D. Choice of Easy and Hard. Chess puzzle. Remove nightmares from the board using a knight. Remove them with the “L” shaped move from chess. You have a specific number of moves to do this. E. BONUS CHAPTER. Connect the dots. Create given constellations by connecting the dots on a grid. F. BONUS CHAPTER. Map puzzle. Traverse a museum basement in the dark. As you traverse, you will turn on lamps and collect keys which open doors in your path to reach the end. Rated 4 out of 5 by mar39 from Enjoyed this one! Good game, but don't waste your money on the collector's edition; the bonus game is just blah. Rated 4 out of 5 by kgustavson from Really enjoyed this! GrandMa studios really upped their game with this installment. HOPs are varied and well done, puzzles aren't anything new but well executed and I enjoyed the story too. There is a "gimmick" but it didn't bother me as it wasn't used that often. Enjoy!! Rated 4 out of 5 by skullfun from ~~A STORY OF NIGHTMARES AND CHILDHOOD TRAUMA!~~ This is a compelling mystery where an evil entity from the world of dreams straight-up called Nightmare has escaped into the real world who is traumatizing innocent people with disturbing nightmares. As a revered agency of the Dark Light, you need to take a dive into this surreal world of dreams and stop Nightmare from doing more damage to these poor souls before you are next. Essentially, Whispered Secrets: Enfant Terrible is a psychological thriller game. However, instead of taking a more serious tone like the earlier Maze games, Enfant Terrible incorporates more colorful fantasy elements into the plot. The storyline definitely has some thought provoking moments and I really found the characters very fascinating and the pacing excellent. This perfect pace, along with the wide variety of locations included in the game, makes Enfant Terrible incredibly addicting – honestly there is never a single moment of boredom in the game. The visuals in Whispered Secrets: Enfant Terrible are simply spectacular. The glossy colors, the detailed artwork, the studio-quality cutscenes, the on-point voice-acting, and the suspenseful music – every aspect of the production hits all the right notes! The development team deserves much credit for this superb addition to the series! The game cleverly intertwines story elements with the gameplay, creating an extremely smooth gaming experience. For those who are concerned, the game contains one little gimmick – the Magnifier – which is neither annoying nor adds much value to the game. 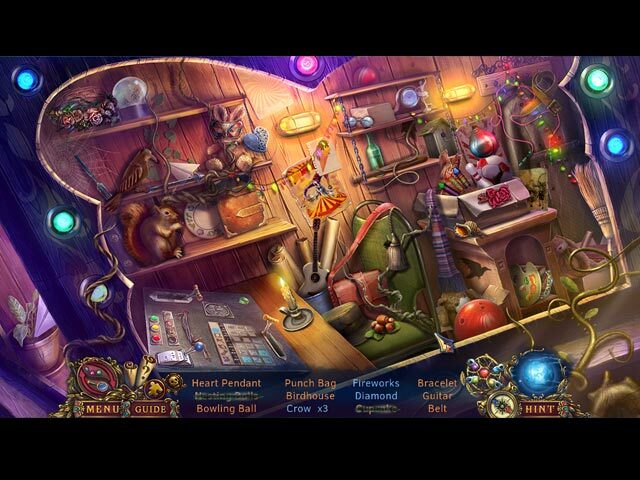 As for the hidden object scenes, which are plenty, you will be glad to know that they are supremely entertaining even though a few scenes do repeat. Further, the puzzles include an option to switch between Easy and Hard mode as well as adopt some cool and neat twists. I also had more enjoyment by selecting the "custom mode" so that I could make it as difficult as I wanted. The game is also generous when it comes to extras. The main game took me four hours to complete, the bonus chapter added another hour of equally-incredible gameplay, and the hidden chapter comes in the form of a surprisingly enjoyable HOP. Other bonus items include a strategy guide, wallpapers, a jigsaw puzzle to assemble a screensaver, concept art, videos, soundtracks, re-playable hidden object scenes, replayable puzzles, achievements, collectibles, and morphing objects. Fans of this series are in for some twists and turns with the content of the story and an extra surprise revelation involving one of the main characters too! This is one of the better Whispered Secret additions and I hope you enjoy it as much as I did. Cheers! Rated 3 out of 5 by lamp_post from Sorry Grandma....Not A Buy For Me! After reading the reviews, which varied quite a lot, I decided to play the demo and decide for myself. Well, I am sorry to say that the game is repetitious and I soooo dislike the black screen between the scenes. By the time the next scene comes up I have forgotten what I was suppose to do and even where I was at. I ended up using the hint button constantly just to figure out where I should be or what I needed to do. Also, I think the amulet and such are useless. I made it through most of the demo, but quit because it was just no fun. Please try the demo first. Rated 3 out of 5 by pennmom36 from LUCKY US, WE GET TWO STUPID GADGETS TODAY! Enfant Terrible is just another "terrible" story about a detective who enters a person's nightmarish dreams to defeat the plague beaked-masked monsters that haunt them. To make matters worse, there are 2 gadgets that are just as believable as the monsters are scary. I've made this statement over and over, "if you can't come up with a creepy looking monster, don't show it!" Leave it up to one's own imagination to picture the things that go bump in the night, catching glimpses of something lurking or stalking can be just as terrifying, and certainly better than seeing these cheesy looking things leftover from a B-rated horror flick! I was super curious about the title they chose, Enfant Terrible. What is an Enfant Terrible? According to the Merriam-Webster Dictionary, it's (A) a child whose inopportune remarks cause embarrassment. (B) a person known for shocking remarks or outrageous behavior, or (C) a usually young and successful person who is strikingly unorthodox, innovative, or avant-garde. I'm going to loosely translate that as a very non-scary, weird nightmare creature you'd laugh about in the morning when you wake up wondering what you ate that caused that dream, which seems to pertain to this story a little more than any of those other definitions. It seems unfathomable, but there are actually 2 GADGETS used in this much anticipated Whispered Secrets game! The first gadget is a Detective's Mirror that detects hidden caches. Let's just stop right here for a moment of silence..............sigh! This gadget brings up so many questions, mostly WHAT? & WHY? Really? Okay, I quickly overcame my grief only to discover that this magical mystery machine requires a Crystal to make it do its mirror master detecting, and guess what, it breaks after one use, of course, and says the same thing each time. "it's amazing but quite finicky" Next up we have a Dreamcatcher that allows the detective to enter someone's dream, aka nightmare. (lets not even talk about the fact that this plot has been done at least once in just about every series) Moving on to the graphics, what happened to the awesome, realistic graphics that were so cool in Everburning Candle? The graphics here are sometimes downright cartoon looking. The nightmare "monsters" are cheesy looking and so not scary. I used to love this series, but 2 gadgets, a been there done that storyline, large unrealistic graphics, and cheesy looking monsters, has me seriously doubting this series should move forward! 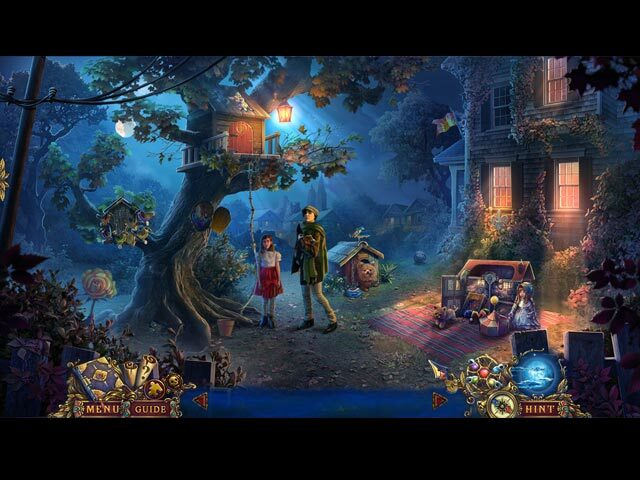 The Hidden Object Scenes are in abundance, but some of the scenes are repeated. Most of the HOS are in the form of sketches in a book to progress the plot or give background sight to fill in the blanks of the story, tasking you to find and replace 3 Keyword Items on each page. There are also Progressive Interactive Silhouetted Shape Finds, Items to find to use as a tool to open up the Interactive Listed Items, Multiples of the same Item Finds, Finding all Morphing Objects, and several Zoom Zone HOS to find a handful of Listed Items, some of which require a slight interaction. There is an optional Match 3 game to play if you're not into Hidden Object Scenes. The Mini-Games are numerous and many of them are available in an Easy or Hard Difficulty Mode. Below are brief descriptions of some of the games you'll encounter during and after the demo: 1-Swap upper & lower lock teeth to match the key shape. 2-Hover over green orbs to collect them while avoiding red orbs. 3-Swap the positions of the yellow & blue tiles. 4-Draw a single continuous line to all symbols on the dreamcatcher. 5-Fill meter by clicking the red buttons when the blue icons reach the green zone. 6-Select the numbered branches in the correct order. 7-Place railroad tracks correctly onto the silhouetted shapes. 8-Light all haystacks in a single line using directional arrows. 9-Swap puzzle pieces to reconstruct the image. 10-Place the stars into the correct slots. 11-Select the pumpkins in the correct order by trial & error. 12-Slide tokens along paths until they reach the correct slots. 13-Plant at least 3 seeds in a row, new ones grow after each move. 14-Select matching pairs of keys. 15-Place torn fragments into their correct silhouetted shapes. 16-Fill all squares by selecting & dragging limited moves colors. This Collector's Edition version has10 Wallpapers, 12 Concept Art pictures, 15 Achievements to earn, 8 Music Soundtracks, 11 re-playable Movie Cutscenes, 25 re-playable Hidden Object Scenes (Best Time & Best Accuracy % scores) 11 re-playable Mini-Games (Best Time scores) 35 Collectible Memorable Objects (collect 35 memory objects to unlock the Hidden Chapter) 20 Hidden Zoom Zone Jigsaw Puzzle Pieces (assemble the 20 piece Jigsaw to set the Screensaver Wallpaper) 21 Morphing Objects, 5 Main Chapters (The Nightmare) +Hidden Chapter (Forest of Dreams) +Bonus Chapter (The Last Sleep) and a built-in Strategy Guide, sleep well and enjoy! WHISPERED SECRETS SERIES LIST Title***Collector's Edition Release Date***Average Rating 1-The Story of Tideville (October 7-2012) 3.9 2-Into The Beyond (November 14-2013) 4.1 3-Into The Wind (October 4-2014) 4.2 4-Golden Silence (August 6-2015) 4.2 5-Everburning Candle (March 31-2016) 4.4 6-Song of Sorrow (November 12-2016) 3.7 7-Forgotten Sins (September 2-2017) 3.7 8-Enfant Terrible (July 5-2018) n/a by: GrandMa Studios Ltd. Rated 2 out of 5 by Yurnmesis from Trial: Bright Colors! Childish! Boring! Bizarre! I had to force myself to continue to the end of the trial. The introduction was the best thing about the entire trial. I dislike purple and bright colored graphics as well as a story with cluttered scenes that jumps all over the place. Rarely say bored, but in this case I really didn't want to experience another bizarre scene or see more garish colors along with a rather childish approach to scenes and concept. Wasn't sure if this was supposed to be a Halloween story or what! Picture book back story was simple and boring...green acres to mansion! Hidden objects games were so easy to the point of why bother. Mini games were well crafted but nothing new and rather boring and predictable. I won't purchase this one because I really don't care what happens to any of the characters and that's a very sad commentary. Give it a trial run to see if you enjoy the content. Rated 2 out of 5 by Granny_Gruff from Repetitious, Boring Monotonous, Tedious, Dull, Tiresome, Pedestrian To help with the nightmares that he's had since childhood, Ethan Jackson goes to see a "famous" psychotherapist, Naila Moore. The dream catcher she gives him seems to make things worse. Ethan has come to you, as a detective, to help him find a good night's rest. (I can't figure out why a detective was his next step in treating nightmares.) This boring rehash of an all too familiar pedestrian plot brings nothing new to the table unless you want to count the long seconds with a black screen as the scenes change. The detective's magnifier and the dream catcher amulet/artifact are your tools and they are just as useful as you would expect. There are shaped key locks on almost everything, deserving or not. There was so much that has been seen elsewhere that I rapidly decided to pass on this copycat. Please read ALL the reviews and play the Demo so you will know what you are letting yourself in for! Rated 2 out of 5 by cathybobcat from "Terrible" Is Putting It Mildly. This might not have been so bad if it hadn't been so TERRIBLY BUSY in scenes going back and forth finding an excessive amount of inventory, doing this and that.....for what?! It is overly hyperactive. I began using the hint to progress, which is never a good sign. After a while of such monotony, I just gave up and was relieved to exit the game. There are tiny mini hops (they are getting smaller and smaller) and story book hos. It is lacking and cheapens the game.....as well as other unnecessary tasks that hold you hostage to a scene. There are also "TERRIBLY" long loading scenes where you only have a black screen. Maybe that's one of the best parts of this game. Puzzles outnumber HOS and there are puzzles that are irritating...having to fight someone and then playing arcade types that many may have problems with because of the required quick clicking. I don't like it and find it stressful....so end up using the SKIP. It is indicated you can replay both, but the number is locked....another detriment to buying. I like to know what I am getting in a CE. You have to find morphing objects which takes up more time having to wait for them. It might be ok if you buy the game, but not when time is an element in a demo. You have puzzle pieces to find. I found it difficult to locate some. I saw some other collectibles which I think were Memorable collectibles, whatever they were because I just wanted to forget this and didn't really care because of the tedium of the other activities required. There are small indicators for the morphs and puzzle pieces in the lower left. You can find their locations in the back of the SG, which I was doing way too often. The only positive thing I can say is that the graphics were decent and some scenes artistically done. It is a shame it had to be ruined with nonsense. What could have been a pleasure resulted in one big chore and disappointment. There isn't anything CE appealing here. It was not enjoyable at all. Rated 2 out of 5 by campingramps from You're kidding me, right? 5 stars? I read the first 2 reviews and thought "This might be a pretty good game". Boy, was I wrong. This one turned out to be a typical HO that is so common these days. You spend, literally, the whole game running back and forth opening and finding I bet hundreds of 'things' to open and get access to hundreds of other things. I played the complete demo just to see how far I could last and I sighed in relief when the demo ended. There is nothing redeeming in this game at all. Story is lame, HOs and mini games are a joke, graphics are below average and the characters are way too child like. Some of the scenes are so busy that I started to go cross eyed with all the sparkling and flashing lights. There is no logical sequence in the events of this game and I cannot understand any rating over 2 stars. It's not there. I don't recommend this game but I do recommend that you look for another game on Big Fish because they have so many that are better than this one. Rated 2 out of 5 by jennsmom from I wanted to like this game However, even though the graphics were good, and it had an interesting story line and I'd like to find out what happens next, I am not interested in seconds long blackouts between scenes. Is the purpose to make the game seem longer? Whatever it is, it has made this game a "no purchase" for me. Rated 1 out of 5 by MissAbby from Bad Dreams Are Better Than Bad Games I feel as if I'm in a bad dream playing this repetitive, ridiculous and snoozeworthy game! The graphics are great, the rest is a recurring nightmare of almost every CE put out these days. Same plot! Even the same gate! Same Detective performing the same silly actions, finding silly things to open, fix or make a puzzle pop up that has no relation to anything happening at the time. I'll let the others explain all the details of how many puzzles, how many hops, morphing objects, and hidden things to find. The game has them, 'nuff said. I am getting tired of the constant use of Native American Dream Catchers being used for good, evil, magic and as hidden objects. Dream Catchers were a kind of spiritual charm and should be left to the Native American Culture, instead of being tossed around in computer games. In my opinion this game is not worth the money or the time. I would love to see something new and challenging.. Rated 1 out of 5 by twinsoniclab from Again with the Amulet! Really? An ancient amulet causing nightmares? Pulled into the dream/nightmare world? I could have skipped the demo and known nothing was new based on the game description. But, I played the demo, but only lasted one chapter (which was just 15 minutes long). I checked the upcoming attractions and tasks in the SG, and saw nothing new, just a list of more of the same inventory and tasks as usual, as well as the oh, so blue graphics. We start the game (after getting a note on the street) at a scene we're all familiar with. Too familiar. We are outside mansion gates, which are locked. There are pillars topped by stone crows. A locked mailbox is set into the right pillar, a lamp into the left. The address plaque reads "13," an ominous address indeed! Keys to open the gate are naturally just out of reach. We have our detective bag, but it has a ribbon tangled up, so we can't open it! Oh, no! Our first tasks? Well, obviously get into our bag, get those keys, read the homeowner's mail. You know, same stuff, different game. So. We find the seed to feed a bird to get the token to read the mail. Find a magnet to attach a ribbon to get the keys. Once inside the gates, here we find a lock needing an initial token, a lion needing a ring in its mouth, rusty clippers (have no fear, they don't even get to our inventory, they "come with" a whet stone which automatically sharpens them! ), The last scene of chapter one is no more original. Get a recipe and find the ingredients (in one bunch) to make a potion (not much to do to make) to sedate the nightmare victim. Did I forget the gimmicks? We get a "detective magnifier" which reveals "hidden places." These are just scenes where you find seven morphing objects. Also, the nightmare inducing dreamcatcher, which runs on "energy crystals." Each time its used the crystal power is used up and we need to find more. Chapter one ends with the world shattering (Evan's words, not mine) and we find we have entered his nightmare world. A very blue nightmare world. Where we will add a bucket, a well handle, and a broken torch to our inventory. No thanks. Notice I didn't get into the HOS or PUZZLES? That's because there were none worth mentioning! You do have those "hidden places" game, with it's seven item search. Other than that, they aren't worth mentioning, except to say they are easy and boring. Also, there are long black waits between scenes. I thought hard on whether I "hated" this game (1 star) or just "disliked" it (2 stars), but in the end realized I "hated" it because it was nothing new and I'm sick and tired of that! So, no, I don't recommend this game, can't understand why it's an "Editor's Choice."